/ Is Havanese a Bichon? What are Some of the Breed’s Charateristics? Today, I am going to answer the question of whether Havanese is a Bichon or not. I will also talk a little bit about the some of the common characteristics of a Bichon. It is going to be a short and fun read for you to learn more about your cute Havanese. Okay, let me give you the answer to your question right away. Yes, Havanese is a Bichon. The Havanese belongs to the Bichon family and it is suggested that they share common ancestors with Bichon Frise and Maltese. From the picture that you see at the top of this blog post, you can see how the Havanese, Bichon Frise and Maltese do actually look quite similar. For the sake of fun and learning about the story about your Havanese, let’s look at some general characteristics that the Bichon family share. 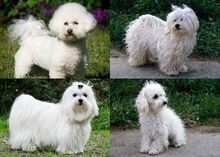 Have you noticed that the Maltese, the Bichon Frise and the Havanese all have tails curled over their back? That is one of the common features of Bichon. That subtle detail is actually one of the many little things that makes the Havanese look so cute. Next time, you walk by a Bichon Frise of a Maltese, observe closely and see how they share some common features while looking different enough to be classifies as different breeds. Maltese, Bichon Frise & Havanese all have drop ears. That is arguably the cutest feature of the Havanese and the other Bichon dog breeds. It is very difficult to imagine the Havanese without the drop ears. They do really make the dog look very friendly and not aggressive. By the way, the cheerful character of the Havanese do match really well with the cute drop ears. Another very cute feature of the Bichon breeds is that they all have very large and dark eyes. The eyes are so beautiful that it sometimes feel like you can even read their emotions from their big eyes. I actually believe that dogs have the ability to express some of their feelings through their eyes just like how human can express happiness and sadness through their eyes. It is just a pleasure to see their big eyes and hard to deny their request for food or playing time when they look at you with watery eyes. All Bichon breeds have the tendency to live for 15 or more years. 15 years may sound like a long time but the 15 years, in reality, flies so fast. Sometimes, I wonder why the creator can’t make human and dog like equally long as they are simply best friends. Yet, I know it’s meaningless to wish for things that are far from the fact. It is more productive and meaningful for us to put focus on things like what we should do with our Havanese this weekend? Where should we going hiking this Sunday? What are Some of the Most Common Bichon Breeds? Some of the better known breeds that belong to the Bichon family includes: Havanese, Bichon Frise, Maltese, Coton de Tulear, Bolognese, Löwchen, and Bolonka. Although they belong to the same family, you can tell that they have been adopting to different environment, living in different parts of the world and bred with different types of dogs throughout their evolution history. Just look at their hair, some of wavy hair while some don’t. The Havanese and other Bichon breeds are very popular now and the trend doesn’t seem like that it is going to slow down soon. However, in the 80’s, these small dogs are just not that popular. Their population declines until early 20th century when it just starts to pick up when people, for a lot of reasons, begin to appreciate these cute and cheerful dogs. The Bichon breeds are all very small and I think this is one of many good reasons whey they gain popularity since the 20th century. People in recent years tend to have smaller and smaller homes and Bichon breeds like Havanese are so small and so good at adopting to small apartments. They make them very ideal for dog lovers to own. All the Bichon breeds are generally very playful and cheerful. But they are not considered way too active. Most people like the above-average level of energy of them. Although all Bichon breeds do share some common character and they can sometimes be quite obvious such as their appearance, there are also some noticeable difference in their temperament too. Coton de Tulear usually are stronger and has a higher level of energy. They need to be trained in a more proper or formal way so that they don’t don’t soon ruin your house. They do generally need more attention than the other breeds in the Bichon family. Bolognese is a relative more quiet breed that needs less attention. That is good for those of you who like to have their home quite quiet and don’t have too much time to spend with their dogs. Of course, you still need to spare them to play with them and walk with them no matter how little attention they ask for. The whole Bichon family have good potential to be trained as watchdogs. Don’t confuse watchdogs with guard dogs though. They are definitely not big and strong enough to become guard dogs. They have the intelligence and they are born with instincts to detect strangers and possible danger. Looking the cute and small Havanese, it is hard to imagine that it can be trained as an awesome watchdog. To summarize this blog post, yes, the Havanese belongs to the Bichon family. Secondly, they are all cute looking small dogs with dark, big eyes and drop ears. They are all cheerful and playful which makes it such a pleasure to play with them.